An example of living history has been on display recently at the Camden Show, the annual celebration of the rural heritage of the Camden district. The show is an immersive experience for participants and observers alike in the real smells, sounds and sights of a sample of the farm in rural Australia. The show represents the authentic real life of country people. It is a performance bringing history to life by storytelling through a host of demonstrations, events and displays. The show is historical representation of the past in the present illustrating a host of aspects of rural heritage through experiential learning. The show reveals itself in a multi-layered story of continuity and change on the edge of the Camden township. What was once a small isolated rural village at the Nepean River crossing and is now a thriving Sydney suburb on the city’s metropolitan fringe. Competitive sections of the show have come and gone with changes in the farming economy. Livestock, produce, craft and cooking sections each tell a story of different aspect of rural life. What was once an integral part of the rural economy is now a craft activity and completely new sections have appeared over the decades. Where once rural artisans were part of the local economy their activities are now demonstrations of heritage and lost trades. Show patrons once used to arrive in a horse and cart today’s show-goers watch competitive driving of horse and sulkies in the show ring. Sideshows and carnies continue show traditions that have their origins in English village fairs and carnivals of the past and even a hint of the Roman Empire and their circuses. The success of the show illustrates a yearning by those attending to experience and understand elements of the traditions of a rural festival in the face of urban growth and development. The Camden Show is a rural festival that is part of the modern show movement that emerged from the Industrial Revolution. The first series of agricultural shows in the early 19th century demonstrated modern British farming methods and technology. The first agricultural shows in New South Wales were in the early 19th century and the first Camden Show in 1886. The 19th century agricultural show movement set out to demonstrate the latest in British Empire know-how and innovation in farming. The site of the show on the Nepean River floodplain is one of the first points of contact between European and Indigenous people and the cows that escaped from the Sydney settlement in 1788 former the Cowpasture Reserve in 1795. For living history it is material culture which grounds the audience in time and place. The CHN was out and about in the local area as you do on a recent overcast day at the Camden Showground. The occasion was the The Argyle Affair Christmas Market for 2017. The market attracts visitors far and wide. One pair who spoke to this blogger came from the New South Wales South Coast and were particularly taken with the local music talent. The grand old showground dusted off its cobwebs and hosted this great community event for all and sundry. The ground came alive with the sound of fresh talent in the music tent, while around 50 pop-up stallholders were scattered on the grass while others took up residence in the AH&I Hall. The Argyle Affair organisers Peta Borg and Brooke Murphy excelled themselves yet again from their last effort in June which attracted a large crowd of enthusiastic patrons. ‘showcase local talent and giving Mums a platform to show their wares and creations’. ‘We aim to provide a safe and confidential environment where we can offer assistance, providing welfare services such as emergency food relief, advocacy, document assistance, phone access, and computer availability with free Wi-Fi’. Market goers were asked for a gold coin admission or hand in an item of food that went to Turning Point. The Argyle Affair organisers are continuing a strong community tradition of local festivals going back well over a century where local folk came together to support worthy causes of one sort or another. Camden Community festivals have come in a range of sizes, types and causes from small street stalls, to large events like the Camden Show. Other examples have been the week long celebrations for the 1960s Festival of the Golden Fleece and the annual Rose Festival. Festivals are an important part of all communities in the city and bush. Festivals are especially important for small rural communities and they are run with a lot of team spirit. Festivals have even become of an interest to university types. The grandest local festival is the annual Camden Show which has been going for 131 years. It is a celebration of the town’s rural heritage and over 30,000 people cannot be wrong. The annual rural festival even has Miss Camden Showgirl, one of the few still remaining. Fittingly The Argyle Affair and its display of traditional crafts by local women carries on the rural traditions of the Camden Show festivals and a celebration of local arts and crafts. Meanwhile back at The Argyle Affair the weather was kind for a while and then promptly at 2.30pm on the dot the heavens opened up as a rain front moved overhead. Liked drowned rats outside stallholders packed up while the assembled rushed for the AH&I Hall out of the wet where there were a host of other stalls. But Camden festival goers are a hardy lot and the show went on. The Christmas Argyle Affair organisers sponsored a line up of fresh music talent from the local area. Be adventurous and have a listen to some of this talent using these links. You will surprise your ears. Camden had yet again excelled itself and has been the location of a successful festival of music, food and crafts. In 2018 treat yourself and your friends to a great and memorable experience just like the folk did at the 2017 Argyle Affair Christmas market. For the complete listing of 2018 events, and lots of other great stuff, see the In Macarthur lifestyle magazine or the Macarthur tourism website with lots of helpful bits and pieces. At South Camden there was once a favourite restaurant and venue for local weddings and receptions. It was the White House Farm at 451 Hume Highway South Camden. The restaurant was demolished in the 1990s and replaced by a service station. The site of the White House Farm is the location of many fond memories for family and community celebrations and anniversaries. The White House Farm is a local example of mid-20th century modernism influenced by a ranch-style from the West Coast America. It was timber construction, a tile roof and shutters to the windows. Camden had a number of ranch-style houses that was a style of domestic architecture that was popular in Australia in the 1960s. A number have since been demolished, like the White House Farm. The ranch-style architecture is described for its long, close-to-the-ground profile, and wide open layout. The style fused modernist ideas with the wide open spaces of the American west to create an informal and casual approach. One characteristic of many ranch-style buildings were extensive landscape grounds. The unpretentious nature of the style was particularly popular between the 1940s and 1970s. The style lost popularity with a return to more formal and traditional styles of architecture. Located on the Hume Highway to capture the passing traffic the White House Farm was built in 1966 and run as a restaurant function centre by the owners, Mr and Mrs Henry Hart, until they it sold in 1985 to Alfred and Jennifer Milan. The complex had a large commercial kitchen and could hold two wedding receptions at the same time. It had a seating capacity of 220 in two dining rooms, one of 75 and the other of 130. In 1984 the restaurant advertised ‘Chicken in the Basket’ for $12.50. Patrons could have a ‘whole tender, spring chicken, old fashioned stuffing, baked to perfection. Served in a basket surrounded with special fries, crumbed onion rings and homemade corn and banana fritters’. This delicacy was accompanied by the ability of patrons to select their ‘sweets’ from a self service area. Complimented with tea and coffee of choice. This ‘tradition’ was proudly introduced by Hart family ‘in the 1950s’. The restaurant traded five-days a week from Tuesday to Saturday, lunches from 12 to 2.30pm, and dinner from 6pm. Sunday was reserved for private functions. There was the attraction of a half-price children’s menu. Bottles of wine averaging between $5-$6. The restaurant menu had a number of delicacies that are not very common these days. Entrees of prawn cocktail, fruit cocktail, and melon with ham, while the main dishes specialised in steaks and included carpet bag steak and steak diane. There were the poultry specials of chicken southern style and chicken in the basket (whole) and salads which included ham and chicken and cheese and pineapple. On Facebook Susan Vale recalls as a child ‘I remember sleeping in the car parked in front while mum and dad enjoyed a rowdy dinner with friends. It was the place for a nice meal’. Weddings were catered for with formal or informal reception rooms from two available menus at the exorbitant price of $13.00 and $14.50 per head. The grounds provided award winning ‘beautiful garden style settings’ and the owners could organise music, photographer and cars for the bride and groom. The motel was a two minute walk away a local motel, the Camden Country Club Motel (now also demolished). The wedding party could bring their own drinks and there was no time limit. In 1990 the Camden press claimed that ‘newlyweds are promised a relaxed and special day’. The garden had a ‘relaxed and friendly atmosphere’ and it was like have a ‘home garden wedding’. For those who wanted something a little different the restaurant owners could organise a Scottish Piper ‘in full regalia’ or a ‘Sweep-a-gram’. The restaurant had their own DJ, master of ceremonies and musicians. The brides and grooms were promised ‘romantic weddings in a colonial home atmosphere’ catering for groups between 30 and 130 guests. One of those brides was Marie Larnach who recalls on Facebook that she had her ‘wedding reception there in 1973’. Similarly Brenda Egan had her wedding there as well. The owners lived in a two-bedroom flatette above the main building. The auction notice for February 1986 said that it was ideal as staff quarters. The notice boasted that the White House Farm was a local ‘landmark’. The restaurant was sold with an adjacent two-bedroom cottage. The White House Farm had lots of parking space on a lot of 6872 m2 and was an ideal venue for local weddings and large family functions. Today the site of the White House Farm is occupied by a service station. Marie Larnach Had our wedding reception there in 1973. Charlene Lindsay My grand parents bought the place in 1965/66. I was around 2 years old. My mum, dad, aunty Angela and uncle Tino run the restaurant between them for over 25+ years. The original building had the living area upstairs. The original kitchen of the restaurant was where the bar area in later years was situated. Before the Sydney/Melbourne freeway was completed greyhound buses used to stop by for lunches. The party room was built by my dad and uncle Tino. The kitchen addition at the rearvof building was built years later with the final extension to the a rea built in the 1970’s. We could have a wedding of 150 odd people in the party room a wedding of 80 or so in the dinning room extension and the restaurant of another 50 odd people going all at once. Seriously busy. Most popular table was ‘lovers corner’. Back in its heyday drivers like Peter Brock Alan Moffitt Colin Bond would dine there after racing at Oran Park. My grand parents also lived in the next to the White House Farm. That house was previously owned by an old lady by name of Mrs May. She used to sell her fruit n veg by the side of road Hume Highway. I miss those days 😊. After my aunty Angela died my grand father didnt have his heart in it anymore – pardon the pun! Later my uncle Tino and his second wife Nelly bought out the rest of the family. Ian Willis: What was your grandparents last name? CL: Harry and Sitska Hart they came over from Holland in about 1950. They had identical twin daughters Angela and my mum Charmaine and a son Henri. Ian Willis: Did your grandparents build the restaurant? CL: No they built the wedding reception dance floor room and the restaurant addition on north side of the original building also the commercial kitchen and the fish pond. Katrina Woods I had the privilege of being neighbors of Charlene Lindsayparents Paul & Charmaine – I worked in the local store at Douglas Park & one day Paul asked me if wanted to work at The White House Farm ? In about 1979 ? I took up his offer – had many enjoyable Saturday & Friday nights – worked the weddings in the restaurant also kitchen – i was blessed to have had my engagement & wedding at this venue . Susan Vale I remember sleeping in the car parked in front while mum and dad enjoyed a rowdy dinner with friends. It was the place for a nice meal. Sheila Caris Our wedding reception was there on the 8th of February 1975 – must have been one of the hottest days of the year & no air conditioning! Chris Robinson We had our wedding reception here in 1990. Very happy memories. The owners and staff were wonderful. Julie Coulter What a flashback! We were married in the gardens 1982 and the had our wedding reception here! Liz Kalmar-Carroll is this where we were asked to leave cause we were too loud??? Annie Austin Our wedding in 71 it was the place at that time.Beautiful. Ryan Punch Did that burn down or am I thinking of something else? Sean Couley Can’t believe it made way for a petrol station. Tracey Kennedy We had our wedding reception there 23rd March 1985. Julie Ralphs Wow, that was another lifetime ago. Had my wedding reception there in May 1988. Charming venue. Megan Murdoch My parents held my Christening there in 1965!! Michelle Maree Where is White House Farm? Denise Taranto Sandy Evans….was this your venue? Louise Skinner Yep had our wedding reception there in 1979. Jane Mary Darling We stayed there on our wedding night. ! Craige Cole Anna & I had our wedding reception at White House Farm on a windy October evening. It was a fantastic venue and the best party I have ever been to. Such a pity that the state government got involved in a local decision. The local milk bar is a largely unrecognized part of Camden modernism where the latest trends in American food culture made their way into the small country town by Australian-Greek immigrants. The design, equipment and fit-out of local cafes and milk bars was at the cutting edge of Interwar fashion. The cafes were a touch of the exotic with their Art Deco style interiors, where fantasy met food without the social barriers of daily life of the Interwar period. Camden milk bars rarely just sold milk shakes unlike their counterparts in the city. To make a living and ensure that their businesses paid their way the cafes and milk bars also sold fruit and vegetables, meals, sandwiches, lollies, sweets and chocolates. The milk bar, along with other aspects of Art Deco style of the Interwar period, are going through a nostalgia boom. 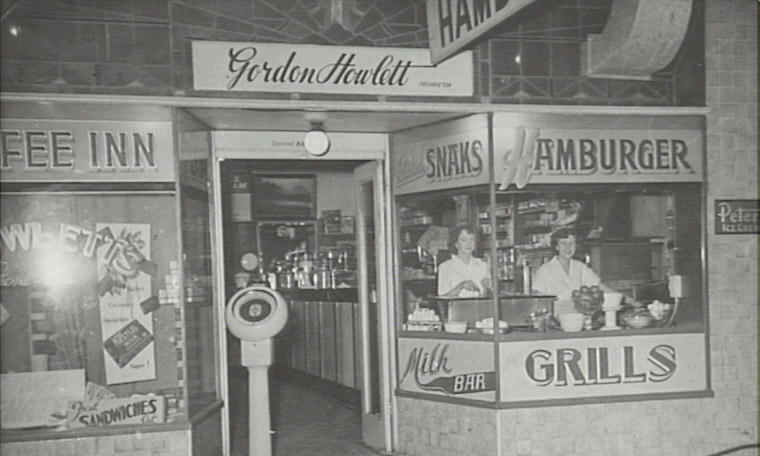 Hurstville Museum curator Birgit Heilmann has written an article ‘Sydney has taken to milk’ with memories of the local residents on milk bars in the St George area. The museum recently hosted a touring exhibition ‘Selling an American Dream: Australia’s Greek Café’, which was part of the ‘In their Own Image: Greek-Australians National Project’ based at Macquarie University. Before the fast-food phenomena exploded in Australia in the 1960s the Greek café was an important influence on Australian eating habits. The mixed grill was supplemented with sodas, milk shakes, hamburgers, ice-cream sundaes, milk chocolate and hard sugar lollies. The Australian Greek café was a transnational phenomena whose origins are buried in the Greek café start-ups on the US east coast where Australian-Greek immigrants, who came from the US, learnt the trade as they came to terms with American modernism. The first milk bar in Australia opened in 1932 in Martin Place in Sydney. It pioneered many of the aspects of the milk bar and was an instant hit. By the 1940s the milk bar had taken off and combined refined dining, ease of access, local cuisines, soda fountains and the first fast food. The milk bars were popularized in the 1930s with the introduction of the milk stirring machine and the malted milk shake maker, while before this the 1920s soda fountains were popular. According to Macquarie University researchers Effy Alexakis and Leonard Janiszewski milkshakes were originally a health food made with milk, fruit, cream, eggs, chocolate, malt and other ingredients. Ice-cream, milk fat and artificial flavours were popularised in the 1950s. Milk bars and cafes were a combination of food and fantasy, and in country towns they were a touch of exotica that often combined with the Hollywood movie palace. The Greek café, according to Joanne Back at the National Museum, was the centre of entertainment in country towns and the centre of life for the first date and the first kiss in the booth. Greek cafes according to Leonard Janiszewski transfered ideas from the USA and transformed them into a combination of American style food trends with Australian cuisine. They were aimed at the whole family and acted to break down the social class barriers that were common in country towns. Greek cafes were often fitted out in the latest in Art Deco style design and furniture from Europe and USA (streamline Art Deco). Sometimes the temperance movement influence was instrumental in trying to get young people away from the hotels. 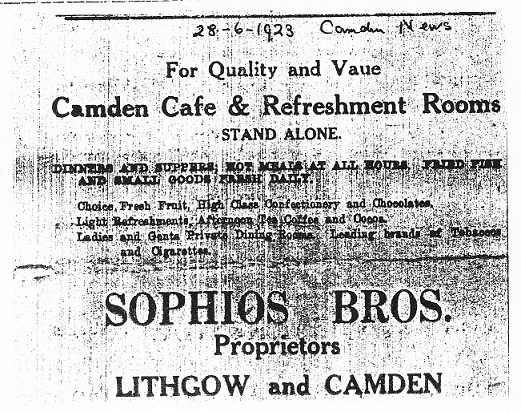 In 1925 the Sophios brothers sold out to fellow Greeks the Cassimatis brothers. 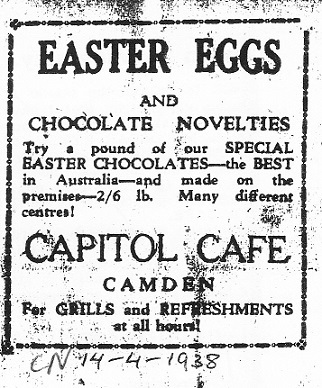 Manual and S. James ‘Jim’ Cassimatis ran the café from 1925 to 1946 and in 1935 renamed the business the Capital Café. They rented the site off the Stuckeys until 1939. 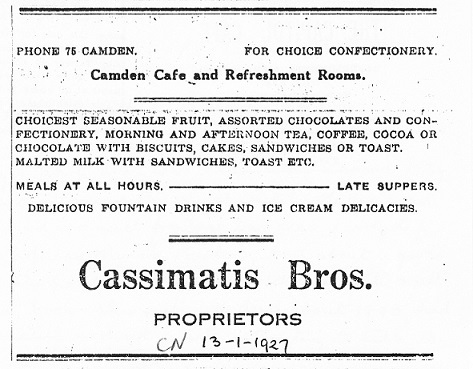 In 1927 the brothers advertised the business as the Camden Café and Refreshment Rooms and sold: fruit and vegetables; afternoon tea, coffee, chocolate with biscuits, cakes, sandwiches or toast; ‘meals til late’; fountain drinks and ice cream. Between 1946 and 1950 Ina Cameron and her husband Gordon ran the café while Cassimatis’s were in Greece. Since 2008 the site has been occupied by Café Crème Della Crème a continental patisserie. In 1946 Ina and her new husband Gordon took over the Capital Café in partnership with her brother and sister in law. They spent 4 years there and Ina says that it was a hard 4 years, although ‘I loved cooking’. ‘The day started at 6.00am cleaning up the long fridge and making sure that everything was OK for opening. We worked all day. All that had to be done every morning. We had to get bread early and put in the fridge to cool it down so that we could slice it up and then put out on table to make sandwiches. ‘On Monday we had fruit and vegetables from Sydney market. I had to do a ‘fruit window’ and get rid of bad fruit. On Monday we made 5 gallons of fruit salad and sold a serve for 2/9. ‘Meals served a mixed grill, 2/9, steak and eggs, 2/6, sausage and eggs, 2/-.We had the best place for tea and coffee. The banana splits were very popular and it felt like we spent half our time making them. We did meals, scones, sandwiches – we did everything. Sausages came from Boardmans, and bread from Stuckeys. ‘The shop layout. There was a long window of ice-cream and one of milk. Along the top of the counter there were little containers with flavouring for milk shakes. Seats in teh café and closed in booths at the back. ‘The buses travelled between the Sydney to Melbourne on the Hume Highway [which ran along the main street] and they would stop in the morning and afternoon. Drivers had a uniform and pretty handsome as well. ‘The pictures were twice a week and we would finish up after midnight after the picture crowd had been and gone. Tuesday was Camden sale day and we provide sandwiches, along with late dinner and fruit salad. The girls who waited for us liked to be on that night [sale day] because they got good tips. ‘The Chinese market gardeners would bring their vegetable to us, whatever was in season. The Chinese market gardeners grew vegetables along the banks of the Nepean River. They give me a bag of fresh vegetables each time they travelled into town. I enjoyed chatting with the gypsy king who would drop into the store for a cup of tea whenever he was in town to visit the gypsies who lived at the bottom of Chellaston Street. Len Hearne wrote in 2014 that Frank and Mary Hearne owned and operated the Camden Café at 91 Argyle Street, (now Camden Pharmacy). The café was a popular stop for servicemen from in the local area [from the Narellan Military Camp, RAAF personnel from the Camden Airfield and the NCOs stationed at Studley Park ECTS]. They came into Camden ‘by the truckload and inevitably they all made their way to the Camden Café for a decent meal. Frank and Mary got to know some of the servicemen before they were shipped out to the horrors of a distant war front. There was one US soldier who was a real loner. His name was Chuck and was based at Green’s Corner [Narellan Military Camp]. He had previously worked in a diner in Los Angeles and when on leave in Camden he would always want to held out in the Camden Café. He left a box of his personal items with Frank and Mary and they tried to contact his home after the war without success. The truckloads of young servicemen who came into Camden when on leave had just one thng on their mind – girls- and would end up missing their truck back to their base. They would often come to Frank and Mary asking them to phone a taxi. The 1948 Camden Social Survey stated the the hospitality sector (cafes, hotels) were the most common form of employment in Camden and employed 74 women out of a total of 121 employed in the sector. It stated there were 5 cafes in Camden employing 20 people in addition to the 5 owners. Donald Howard recalls in his memoir The Hub of Camden (2002) the cafes of the 1940s. ‘In the first summer [working at Whiteman’s General Store] I found myself consuming 6 milk shakes a week. In those days they were rich and creamy with natural fruit flavouring, but 6 a week meant that 20% of my gross income was being blown on my appetite. I took a drastic step and halved the intake. I was learning that to achieve a certain goal, some sacrifice was often needed. One more lesson for life!’. Fred Gibson, who came to Camden in 1953, recalled there was the Paris Café on the corner of Argyle and Hill Street, Howletts Café is now a hamburger joint. He said that ‘milk shakes were what we drank when you under 20. You never thought of going to the pub. You often bought soft drink – ginger beer – sometimes put a scoop of ice cream in the drink. In 1938 Pinkerton’s ran a café and they baked their own buns, pastries and cakes. 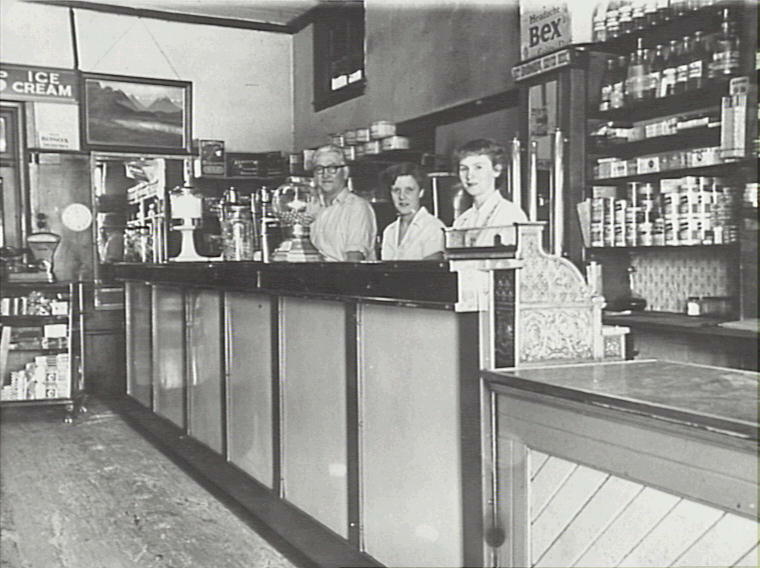 In 1949 Burnell & Sons operated a milk bar at 122 Argyle Street, next to the Commonwealth Bank (recently the site of Gloria Jeans Cafe to 2014). They served McInven’s Ice Cream, iced drinks, fruit and vegetables and offered home deliveries from the milk bar. The most iconic Camden milk bar was the Camden Valley Inn Milk Bar which opened in 1939 by the Macarthur Onslows as part of the promotion of their Camden Vale brand of milk. It traded on the healthy qualities of milk at a time when they were promoted by milk authorities in New South Wales. It is one of the outstanding buildings of the Interwar period in the Camden area and was built in the mock-Tudor style that was popular at the time. It was fitted out with the latest milk bar equipment and was noted for having the first drive-through facility in the Camden area where patrons were served milk shakes while seated in their car. John Wrigley stated in the District Reporter in 2005 that the inn was constructed to promote the sale of Camden Vale milk products which were produced by Camden Park Estate. It was located at the southern end of Camden on the Hume Highway and promotional material boasted: ‘delicious milk drinks of all kinds made from Camden Vale special milk will be served. Camden Vale milk and cream will also be for sale. A feature will be the delicious morning and afternoon teas’. It was opened during Health Week in November 1939 and RH Nesbitt, the chairman of the NSW Milk Board officiated at the opening. He was given a gold fountain pen and paid tribute to the achievements of the Camden Park Estates Ltd. ‘Doctors Harvey Sutton and Petherbridge set the seal of approval of the British Medical Association upon the proceedings’. There were lots of speeches on the subject of the progress of the dairy industry, the modern hygienic methods of production and distribution with special mention of the ‘keen city demand for the special grade of fresh milk under the name of Camden Vale’. Amongst the guests were Major General James Macarthur Onslow, Dr Harvey Sutton, hygienist, eugenicist and educator and Portia Geach from the Housewives’ Progressive Association of NSW and others. 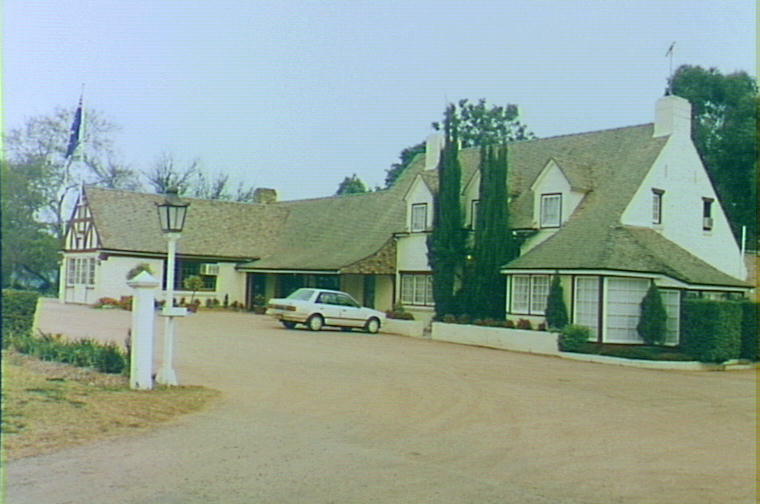 The inn was designed by architect Cyril Ruwald and the entrance door to the inn was under a porte-cochere in the form of a breezeway or drive-through. Annette Macarthur Onslow stated it had the appearance of an old coaching stage. She stated in 2005 in the District Reporter that architect Cyril Ruwald was a friend of her parents, Edward and Winifred Macarthur Onslow. They spent much time examining photographs of English country inns and how to achieve the same ‘charming settled look’ in Camden. Apparently trade in milk-shakes was brisk as the concept was relatively new to Australia as was the concept of a drive-through ‘where one could remain seated in a car and buy take-away milk shakes in waxed cartons’. My Aunty & Uncle owed & ran the Paris Cafe on the corner of Argyle and Hill street Camden . I remember as a child sitting on the backstep of the shop and being treated with an ice cream cone … because my mother used to go and help with the busy times of day lunch time etc … Their name was Amos & Dorothy Dowle ….much later years the Sumners Annette Mark etc parents ran it I recall ? When the first Milk Bar opened in Martin Place, Sydney, in 1932, people queued in their thousands for a taste of America. With its art deco design, and single, sweet product, the impact of Adams’ Black and White 4d. Milk Bar was far-reaching. As they spread across the country, to every town on the railway line, Greek-run milk bars and cafes became a focal point of community life: for celebrations, meetings, family meals and romance. For more than 30 years, historian Leonard Janiszewski and photographer Effy Alexakis have investigated and documented the history of Greek Australian culture. They discovered these cafes and milk bars were a kind of Trojan horse for the Americanisation of Australian culture, bringing in American refreshments, cinema, and music.